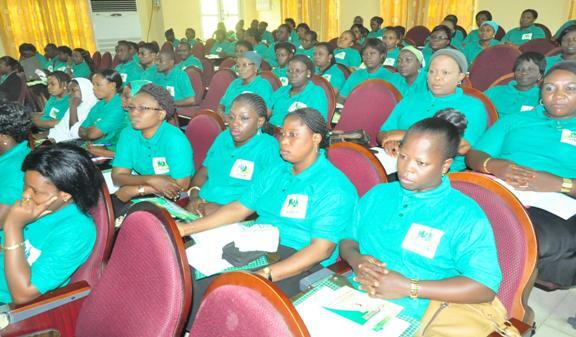 Cross-section of participants at the Workshop. Inset: The DVC (D), Prof. Felix Salako, addressing the participants during the Workshop on behalf of the Vice-Chancellor. “Being able to manage your manager is not about manipulating them, it is about understanding your manager’s needs, identifying their style of working and being able to communicate with them so you can complement their style”. These were the words of the Registrar, Mr. Mathew Ayoola, while delivering a lecture titled, “Managing the Boss – A Principal Obligation for Secretaries”, at the 5th In-House Annual Workshop, tagged “Secretarial Profession: The Journey So Far”, organised by the University’s Secretarial Staff Association (USSA). He gave vivid definitions of the boss and the secretary, noting that no individual can single-handedly achieve an organisation’s goals, without the cooperation of everybody, irrespective of their calling. He also charged “Most disagreements at work are the result of differences in working style rather than wildly different goals. Investing time in understanding what kind of manager you work for will help you to understand how to communicate with them effectively and prioritise your time”. Earlier, the Vice-Chancellor, Prof. Olusola Oyewole, had called on secretaries to embrace training, to make them better professionals in order to contribute significantly to the advancement of the University. Represented by the Deputy Vice-Chancellor (Development), Prof. Kolawole Salako, he said that the functions of secretaries cannot be over-emphasised in any organisation. He therefore called on them to cooperate with Management, because as stakeholders, they have a role to play in moving the University forward, adding that the stability of any organisation depended largely on how well information is managed. The Chairperson of the association, Mrs. Camilla Fatunmbi, while welcoming all to occassion, charged members to always develop themselves through the attendance of workshops and the acquisition of relevant knowledge on their jobs and by also upholding the association’s professional ethics. At the end of the programme, many members agreed that the programme was very enlightening.